The months leading up to the birth of our second child were quite exciting for our small family. Once the positive results came back from the CVS testing, we announced the big news to family and friends and began preparation for another little boy. Life was very good for us during this time. We were in a new home and Ben was adjusting well to his school-life. We talked a lot about the baby when we were around Ben hoping to see if there was any understanding of the coming events. Certainly his life was about to change a great deal. He was about go from being “the center of our universe” to sharing the spotlight with a new sibling. It turns out my concern about how Ben would adapt was completely unfounded. Ben is the most accepting and loving person I know. Adding a new member to our family just gave Ben another person to love unconditionally. We could have had ten children and Ben would have found room for all of them in his wonderful little world. I discovered one day that Ben really did comprehend what was about to happen. Ben and I were in the car one summer day driving around trying our best to cool off. Of course, our impeccable timing had me suffering the last days of my pregnancy during the hottest days of August. Ben looked at me and gestured toward my quite large stomach. He then cradled his arms and swung them back and forth. I’m sure the people in the oncoming cars got a kick out of the look on my face when he did that. He’ll never stop amazing me. I look into the faces of my children and I can honestly say without hesitation that I would not change anything about how my life has played out. 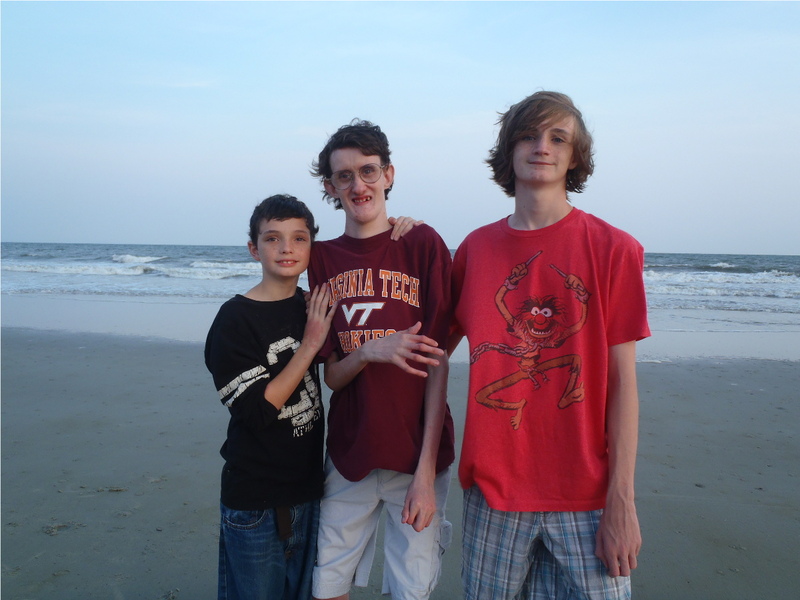 There were times when Ben’s fate was unclear that I thought about what I would have done had I known early in my pregnancy about Ben’s chromosomal disorder. This subject is so controversial and so PERSONAL. No one can know exactly how they will react to news that their unborn child may have life threatening problems. Early testing that now can be done can leave parents with choices that may not have been available thirty or forty years ago. Some parents I talk to consider it to be a double-edged sword. Others look at it as not any kind of choice but as additional information that will help them to prepare for the arrival of their new family member. Regardless of how it is characterized CVS testing can be a very informative mode of early testing for a pregnant mother. A majority of mothers who undergo CVS testing find out that their babies have normal chromosomes. This can reduce the stress that high-risk mothers must deal with when wondering about the fate of their unborn babies. This was certainly true in my case. So what exactly is Chorionic villus sampling. It is a form of prenatal diagnosis that is done one of two ways. Transcervical: An ultrasound guides a thin catheter through the cervix to your placenta. The chorionic villi cells are gently suctioned into the catheter. This is the most common method. Transabdominal: An ultrasound guides a long thin needle through the abdomen to your placenta. The needle draws a sample of tissue and then is removed. This procedure is like that of amniocentesis. I can say from experience…. NOT FUN! Chorionic villus sampling (CVS) detects chromosomal abnormalities such as trisomy 9, as well as a host of other genetic disorders. The doctor takes cells from tiny fingerlike projections on the placenta called the chorionic villi and sends them to a lab for genetic analysis. The test is usually done with either PCR or FISH. The polymerase chain reaction (PCR) is a scientific technique in molecular biology to amplify a single or a few copies of a piece of DNA across several orders detect and localize the presence or absence of specific DNA sequences on chromosomes. FISH uses fluorescent probes that bind to only those parts of the chromosome with which they show a high degree of sequence complementarity. CVS usually takes place at 10–12 weeks’ gestation, earlier than amniocentesis (14–16 weeks). The most compelling argument against CVS is the slightly higher instance of miscarriage that results from the performance of the test. It is up to each person to make a decision about the advantages and disadvantages of this controversial form of testing. In February of Ben’s first grade year I discovered that I was pregnant. Our immediate reaction to the news was unbelievable joy. It took us back to one of the conversations we had with Ben’s first neurologist, Donald Taylor, not long after he was diagnosed. Dr. Taylor told us one of the best things that could happen for Ben was to be blessed with a sibling. He said that delayed children who are able to watch a younger, normally developing child grow, learn a tremendous amount through play and imitation. We were hesitant to tell anyone at first because we had experienced three unsuccessful pregnancies while we were in Charleston. We decided to wait until the second trimester before we notified family and friends, which meant a lot of people were whispering behind my back about my recent weight problem. We also decided, so we could be completely informed about what to expect, that I would undergo what is called a CVS, or Chorionic villous sampling. This is a form of prenatal testing for chromosomal or genetic disorders in the fetus. It entails sampling of the placental tissue and testing it for chromosomal abnormalities. This procedure is more invasive than the more prevalent amniocentesis, but the advantage is that is can be performed at the end of the first trimester as opposed to early in the second trimester as with the amnio. Our reasoning was that we wanted to be able to answer the questions that would no doubt be on everyone’s mind about the baby’s health. This would answer those, and give us one less thing to wonder about. By the twelfth week we would not only know whether the baby had a trisomy, but we would also know whether Ben would have a little brother or little sister. Next up… The pros and cons of CVS testing. .
Ben’s first grade year at Elmont Elementary was one great strides physically. He continued to get stronger and with the help of AFO (Ankle Foot Orthotic) braces he was able to stand and walk without the use of his walker. Ben will always have a halted gait that is common for many who have cerebral palsy, but it hasn’t held him back too terribly. To improve his upper body strength as well as fine motor skills to make it easier for him to sit and write in a classroom environment. To walk longer distances without using walls for support. To begin stepping over objects 4” high and wide. The speech therapists that we were involved with during Ben’s first few years at school were very engaged. They thought, as I did, that we were going to unlock some door in Ben’s brain and he was going to start talking. We knew that Ben was much more advanced cognitively than any testing was giving him credit for. Getting him to speak was the key to a high-functioning Ben. However, as a back-up we continued to explore augmentative communication devices and signing to cover all of our bases. I was happy with Ben’s placement in his first year at Elmont. His teacher was not long out of college and still had an abundance of energy and a desire to make a difference. As the year wore on and Ben’s behavioral issues continued to manifest, I saw a lot of frustration in this young woman. I worried that she was ”burning out” as so many teachers who take on this monumental task do. They have a difficult job; much more difficult that one would imagine. Ben was doing well, but I somehow feel that we missed some opportunities with him in this first grade year. We worked very hard on his communication skills, but he just did not progress as I had hoped. Next up….The big news. A new beginning. I am the mother of Ben, a 22-year-old man with a rare chromosomal disorder called trisomy 9. Ben has an intellectual disability and physical limitations due to cerebral palsy. Though he is non-verbal Ben has always had an instinctive ability to communicate his wants and needs. He spent nineteen years in the local public school system, and I am very proud to say that he graduated from Patrick Henry High School last June. When Ben was born, it took an entire year to get a diagnosis because of the rarity of his condition (at the time there were six documented cases). According to the case studies my husband and I received, there was little hope that our son would live to see his tenth birthday. Though there have been tremendous challenges throughout the years, there was never a doubt that we wanted to care for our son in our home. Last year, when Ben’s years in public school were coming to an end we found out that he had been selected to receive a Medicaid ID waiver. The services provided to us by this waiver have been a blessing to our family. Without it, I can honestly say that I do not know what we would have done after Ben’s graduation. My husband and I both work and Ben has two younger brothers who also deserve our time and attention. More than likely, one of us would have had to stop working, because taking Ben out of our home was not an option. He is an important part of our family, and though his disability can be considered profound, he can, and is being served in the community. Currently, he attends a day support program in Hanover County and is having a great time delivering “Meals-on-Wheels”, and helping the guys at a local fire station by sweeping the floors. Ben loves being out in the community and meeting people. He also loves coming home to be with his family every evening. Ben is the happiest person I know because he is living a normal and dignified life thanks to the Medicaid ID waiver. There are thousands of Virginians who are not as lucky as Ben. They have been placed on a waiting list that is very long and getting longer. The DOJ settlement agreement gives hope to those thousands, that there will finally be a significant effort to reduce that list. Please consider signing the agreement, so that many more will have a life like Ben’s. If you would like to make your feelings on this subject known to the judge, his contact information is below. The Arc of Virginia has put together a very good article which outlines exactly why this is so crucial for the future of all of Virginia’s disabled community. The Honorable John A. Gibney Jr.